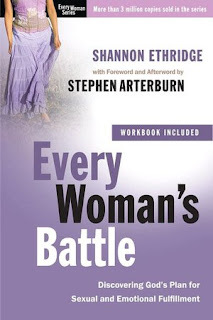 Shannon Ethridge is million copy best selling author who has counseled thousands of women, students and married couples on sexual integrity and intimacy. I had the opportunity to review Every Woman's Battle Discovering Gods Plan for Sexual and Emotional Fulfillment. This book is appropriate for married, engaged or those planning to marry someday. Shannon use a lot of scripture references and asked that wives get more in touch with God and pray about issues regarding their husbands. God knows your husband the best, so why not go to him in prayer about issues that may arise in your marriage. The book doesn’t just give a bunch of answers, but rather Shannon points the reader to look at God for answers. She truly uses this book to inspire a deeper relationship with Christ. I loved the chapter called Taking Every Though Captive. How often do thoughts enter in our mind and we think nothing of them? She challenges the reader in this chapter to be mindful of the entertainment one watches, the type of music, the type of words that come out of our mouth, the type of people we surround ourselves with. She touches on these areas and many others in how our thoughts shape our sexual integrity. Overall, I think this book is an easy read which challenges the reader to pursue a deeper relationship with Christ and to become more aware of one's sexuality and how a female needs to become protective of her mind, body, soul and heart. Did you grab it by the Long Horns? Do you need a Sabbath? What is your job today?